Hyouka was an utterly plain series. It was easy to assume it wouldn’t stand out beside any other high school slice-of-life show. Within that plainness, however, the series presented itself in subtler ways compared to its contemporaries of more defined fantasy and slapstick comedic genres. Hyouka’s “normalcy” helped it present a very grounded take on high school life, carefully depicting the flaws and struggles of its main characters without reducing them to archetypes. Hyouka focuses on the misadventures of a high school’s dying Classic Literature Club. Ultimately sustained by a group of students who end up getting more than what they bargained for, the club soon becomes the center of a makeshift investigation into the school’s past over a student protest that happened on campus years ago. Categorized as a mystery, Hyouka redefined what “mystery” actually meant, turning away from intrigue and chase scenes and towards the thrill of everyday problems and small peculiarities. The “mysteries” the protagonists face don’t involve chasing down criminals or following the paper trails of scandals, but investigating realistic issues in school life through an eccentric lens. The story begins when Houtarou Oreki—detached, lethargic, and Hyouka’s main protagonist—is pushed by his sister to join her old club. Unlike many of the heroic, larger-than-life protagonists common in anime (such as Kirito in Sword Art Online, which aired the same year), Oreki is downright normal. Although not devoid of emotion, he sees it as wasteful to expend energy or passion when he deems it unnecessary—which includes most of the simple things he isn’t pressured to do, such as extracurriculars. Besides being pushed by his sister to join a club, Oreki wouldn’t even go to school if he didn’t have to. At a glance, Oreki is something of a stereotypical light novel protagonist: a young male high school student who often scorns the actions of the other characters and acts as a stand-in for the audience. However, the reality is that Oreki’s bouts of self-deprecation seem to be a means of protection. Throughout the series, Oreki is praised for his intellect and high deductive reasoning skills, which contribute greatly to solving the mysteries the club faces. But Oreki is in constant denial about his capabilities, and his loathing and distance from others is clearly coming from a place of unhappiness. In Episode 11, Oreki gets complimented for his “talent” but then constantly tries to backtrack on those remarks, hiding not behind an act of modesty but of clear denial. This conversation about his “talent” is revisited in Episode 13, when another club member openly expresses their jealousy of Oreki, whereas the viewer knows through internal monologue that Oreki actually undermines himself. Throughout the series, Oreki clearly does have a larger range of emotions, but he hides his pride when he fears failure is possible. He’s uncomfortable stepping out of his comfort zone in order to change, and instead reverts to being withdrawn. Simply put, Oreki exhibits many of the characteristics of someone living with depression. There is nothing that indicates Oreki experienced trauma in his past. He simply is the way he is; depression happens to “normal” people, too. It’s implied he has not always lived this way, and deep down he truly seeks a happier, “rose-colored” school life. Oreki doesn’t force himself to seek solutions to these questions and neither are these solutions forced upon him. Like the mysteries that Hyouka unwraps, “otherness” can come from mundane places. 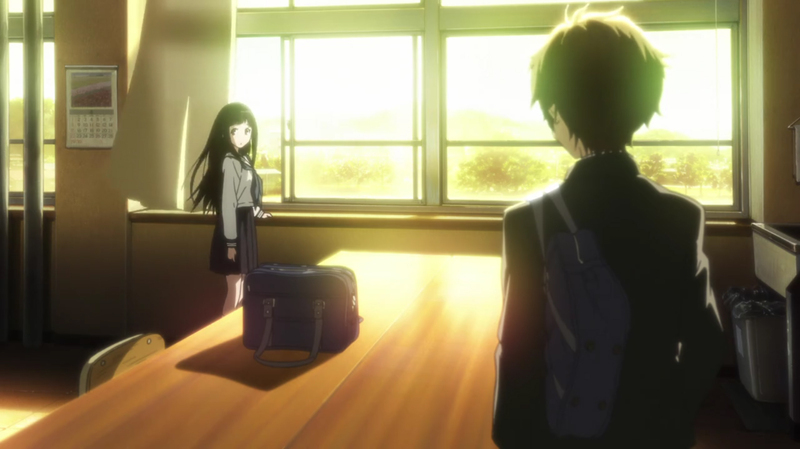 Whether or not Oreki’s coping mechanisms come from deeper issues may ultimately be up to the viewer, but it is significant that Hyouka depicts his depression in a way that “just is,” whereas other fiction might find it is necessary to weigh down their characters with melodramatic traumas. Oreki isn’t tragically miserable, but he isn’t happy either. He demonstrates these anxieties by doubting himself rather than seeking change. Oreki’s journey to coming to terms with and finding resolution regarding his mental health is neither the show’s full focus nor outright forgotten—it’s simply not sensationalized. Oreki is not alone in these personal struggles, as ultimately everyone’s individual flaws and “otherness” unify the Classics Club. But, like Oreki, they seek and solve their objectives not because of their woes or inner struggles, but in spite of them. This is true of every member of the club, including supporting characters Satoshi and Mayaka; but for the sake of brevity, this piece will be focusing on Oreki’s female co-lead, Eru Chitanda. Characterized as having an excessively optimistic outlook on life driven by curiosity, Eru is not reduced to Oreki’s ditzy sidekick. She’s just as intelligent as Oreki—maybe more, when she pushes it—but she views life in an imaginative, unconventional way. Her aloofness and fantastical perspectives are her own otherness. Oreki tries to avoid confrontation with her at first, but he quickly comes to accept that Eru has her own ways of expression—one he perhaps envies. In Episode 3, for instance, Oreki listens while she vents about troubles with her family, both validating her feelings and accepting her unconventional theories on life. Later, Eru proves herself just as capable of solving problems as the other club members when the group meets her family in Episode 7 and she resolves a minute conflict between her siblings. She’s also more than just a one-dimensional manic pixie dream girl. In Episode 6, she has an emotional outburst against a teacher for berating their class. Although the misunderstanding is eventually resolved, the rest of the club is surprised and pokes fun at her for being capable of anger. Eru gets frustrated with the other members, eventually discussing the importance of emotions, opening up to her clubmates about her sensitivities and internal frustrations. Like Oreki, Eru naturally reveals a side of herself she’s held back since joining the club. Although these are small conflicts, Eru proves she’s capable of doing things on her own when she previously needed support for most problem-solving. Her wits and ability to see things from new angles come from a place of naivete, which at first may be perceived as a flaw, but also help to complement the groundedness of the other characters. These are simple, low-key moments in the series, but there’s something special about the way the characters find a sense of unity by accepting and embracing one another’s differences. Compared to a work like My Teen Romantic Comedy SNAFU (commonly called OreGairu), another anime adapted from a light novel which similarly revolves around a group of high school students forming a club that solves problems, Hyouka shows that unity doesn’t always have to come from a place of pain. Hyouka is an adaptation of part of an ongoing series of novels, so while certain mysteries were solved, the characters’ individual issues were left ongoing. The novels carry on to the end of high school, but the anime has no answer to Oreki’s search for a “rose-colored” life. Towards the end of the anime, Oreki and Eru develop romantic feelings for each other, but this relationship does not come to blossom on-screen. Hinting at what might eventually be the rose-colored life he so desires, the final episode of the anime is a shot of Oreki and Eru walking off into the distance, leaving it open as to what exactly their future holds. Oreki doesn’t completely overcome his own struggles, but there’s a clear correlation between him joining the Classics Club and these first steps towards improvement. Working through depression and acknowledging one’s own self-worth is not about finding some magical “fix,” but rather about building a support system and taking small, steady steps forward. The characters in Hyouka were not special. Hyouka as a whole was certainly not flashy compared to a lot of other titles, but that makes it all the more significant. In fact, what makes Hyouka stand out is that it depends on its own mundanity. Many titles based in high school settings tend to market the more comedic, slice-of-life aspects of their narratives or later depend on melodrama. Although Hyouka has its share of seriousness, its protagonists endure struggles and carry flaws that aren’t forced or contrived. Oreki’s turmoil and Eru’s frustrations didn’t need to depend on over-the-top causation; they simply were. It’s a story taking place in the real world. Storytelling and characterization does not always need to depend on the glamour and violence sometimes expected out of fiction. Especially when drawing from the reality that “otherness” can come out of the mundane, it should not always take special circumstances or sensationalism to create drama. Sometimes, it just means taking a second glance at a normal circumstance to find the wonder within it.